I love this time of year. The blossoms are blossoming, the trees are busting buds, the grass seems extra green, and sadly, my allergies don’t like any of it. But, I love it. Really, I do! Something deep inside me gets all buzzely with excitement. It’s spring – a fresh new start! And I love all the stuff that comes along with spring – like candy. Easter candy is the best. Sweet little jelly beans, chocolate bunnies, and marshmallow things that you wouldn’t eat any other time of year but can’t get enough of during the month of April. Along with all that sweet stuff, there’s egg dying. I have fond memories of dying eggs during this festive time of year, and wanted to help create some of those memories with my wee tot, too. But, I’m not super excited about that box dye stuff. 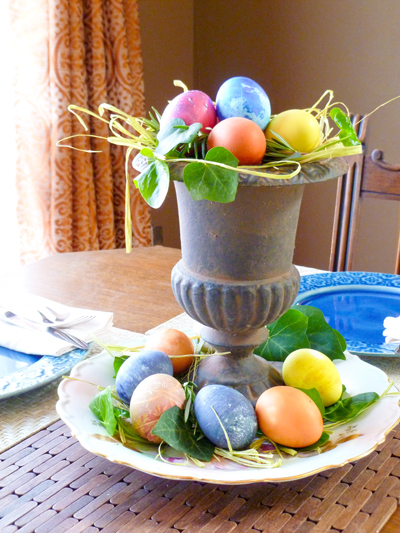 Yes, they create bright and vibrant eggs, but I wanted colorful, saturated, AND creatively-naturally-dyed eggs. I did a little research, conducted experiments, and inspected the outcomes. I think the results speak for themselves – beautiful! There were a couple of disappointments along the way, and my second runner-up for favorite was created from non-natural elements, but still, they all turned out pretty darn cool. Once my eggs were all naturally dyed and dried, I needed a way to share them with everyone – I couldn’t keep those beauties hiding in the fridge! I found some inspirational decorating ideas from the Motherboard, which motivated me to create this lovely centerpiece for my table. I got out a decorative plate, repurposed an old urn, filled it with some light green raffia, a few springs of rosemary and ivy, and then topped it all off with those lovely eggs! 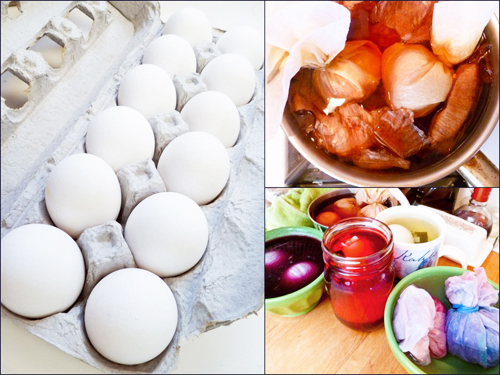 Want to make your own awesome natural dyed eggs? It’s simpler than you think – and you’ve probably got all the ingredients hanging out in your pantry! Hard-boil your eggs. I tried boiling the eggs in the dye to hard-boil them, and none of them really boiled all the way, resulting in beautifully dyed eggs that were nasty in the middle. Ick. Start out by prepping your ingredients. For each dye you can bring 1-cup water to a boil in a small saucepan. Go ahead and add 2 teaspoons of white vinegar to each simmering pot. Now add your dye stuff to the pot. I used beets, onion skins, blueberries, and green tea for my natural colorings. There are other options out there, such as turmeric, red wine, and coffee, but I was interested in seeing what I could create with what I had on hand. I diced up the beet, added it to one pot, put the onion skins in another, the tea bags in a third, and whole blueberries in the fourth. While my four pots simmered away, I prepped my eggs for dying by wrapping a few with thread and a couple with rubber bands – which didn’t work really well. My wee tot even pressed some star stickers on one egg to see what might happen. I also wrapped two eggs in onion skins and then paper towels, and then secured with rubber bands. Once the dyes had simmered for 20-minutes, I turned off the heat. My daughter enjoyed gently placing the eggs in containers (such as bowls or mugs), and I poured the dyes over the eggs. If you need more liquid to cover, just add a bit of warm water. Let the dye come to room temperature and then everything can go in the fridge and hang out overnight. 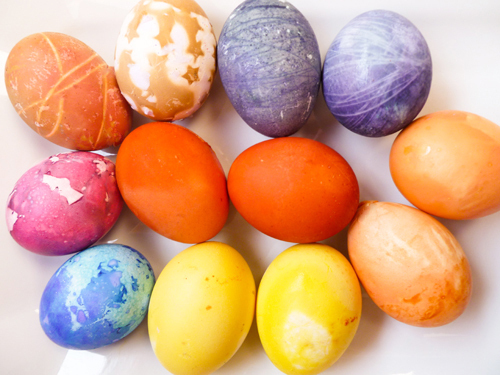 The longer the eggs sit in the dyes, the stronger the color will be. Once I’d had my fun with the natural dyes, I decided to try another idea. 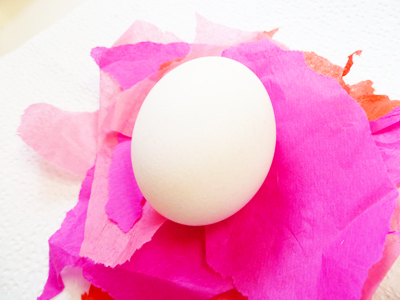 I tore up some bits of tissue paper, and just like I’d wrapped the eggs in the onion skins and paper towel, I did the same with the tissue paper – one with pinks and another with blues. I soaked them in some hot water mixed with a 2 teaspoons of white vinegar, and once they had cooled, put them in the fridge to chill with the other natural dyed eggs. The next day we were so excited to see what those natrually-dyed eggs looked like! After the babe awoke from her afternoon nap, we carefully removed the eggs from the dyes and oohed and ahhhed over the colors! I thought the blueberry and green tea created bold and vibrant colors, with the onion skin dyed eggs shining a bright orange. The biggest disappointment were the beet dyed eggs, which had turned a boring brown – although the babe’s star stickers had created some cool patterns. But, the real winners were the tissue wrapped eggs, creating eggs that looked so bright and interesting – I wanted to make another dozen! *Here’s which eggs were made with what. Starting from the upper left corner – red beet with rubber band, then star stickers. Next were thread wrapped eggs dyed with blueberries (my favorite!). The next two eggs were the onion skin wrapped eggs that also soaked in the onion skin dye. The two bright yellow eggs came from green tea, and then there are the blue (my second favorite) and pink tissue paper eggs. The two bright orange eggs in the center are the onion skin dyed eggs. Such pretty options! We did the rubber band thing last year with brown eggs and loved the results! Loved the dyed egg outcomes, but really admired how you displayed them. Fabulous!!! They are so Fun!!! My mother taught us how to make prints on them with flowers, well, dandelions and leafs. Just place them on the eggs and wrap them in string and boil them in water and purple onion skins… They turn out gorgeous!!! two toned with prints of the leaf and flowers…..
You will love them as well!!! Thanks – these were really fun to make! My daughter also really loved eating the eggs, too! Awesome blog post! I love the results and I’m definitely going to do natural dyes with my kids this year. Our blackberries are turning ripe, so if I can manage to hide a few, we will try those,too! Thanks for showing me another fun way to go green!